Are the doors of justice closed on South African citizens employed by entities with diplomatic immunity? Imagine you are a South African citizen working at either an international organisation or a foreign state (“Missions”) in the Republic of South Africa (“RSA”), you are unfairly dismissed and appear to be without recourse to any labour forum due to your employer’s international status and diplomatic immunity. In terms of the Constitution of the Republic of South Africa, 1996 (“the Constitution”), “everyone” has the right to fair labour practice, therefore, are these Locally Recruited Personal (“LRP”) described above really without an effective remedy? Missions enjoy certain immunities conferred on them by law and separate agreements entered into with the Government of RSA. However, without prejudice to their immunity, these Missions have a duty to respect the laws and regulations of the receiving state in terms of both Article 41(1) of the Vienna Convention on Diplomatic Relations of 1961 and Article 55(1) of the Vienna Convention on Consular Relations of 1963. Therefore, despite the immunities that these Missions enjoy, their cooperation with DIRCO in a matter referred by the Commission for Conciliation and Arbitration (“CCMA”), is imperative to the sustainability of their relationship with the Department of International Relations and Cooperation (“DIRCO”), and the Government of RSA respectively. The employees’ Constitutional right must be balanced against the employers’ right to immunity in these instances. With these conflicting rights in mind, DIRCO, together with the Department of Labour and particularly the Director of the CCMA, have consulted and implemented the Policy on the Management of the Diplomatic Immunities and Privileges in the Republic of South Africa (“the Policy”). The Policy and particularly part 5 thereof, govern and manage an instance wherein a possible unfair labour practice exists between LRP and Missions with diplomatic immunity. This Policy was created with a solution in mind which would facilitate the interplay between labour law and international relations and more specifically diplomatic immunity and jurisdictional issues which arises in these cases. 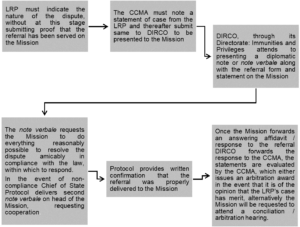 The CCMA is governed by Conduct Rules (“the Rules”). In terms of rule 14, if a jurisdictional matter arises (a point in limine) which has not been determined, the Applicant/referring party must prove to the commissioner that the CCMA has jurisdiction. A point in limine (based on jurisdiction in this instance) is a hearing on a specific legal point, which takes place before the actual case referred can be heard. It is a process that addresses the technical legal points, which are raised prior to getting into the merits of the case. What must be borne in mind is that during the conciliation process, a party may not be represented by a legal practitioner, therefore, this technical point in limine is practically difficult for LRP to overcome at conciliation proceedings, without knowledge of diplomatic immunity and the laws that govern it. What about the enforceability of the award made against the Mission? The CCMA will forward a copy of the award to Protocol, which will thereafter forward same to the Mission, with a request that the Mission should comply with the award in terms of the Vienna Convention on Diplomatic Relations. 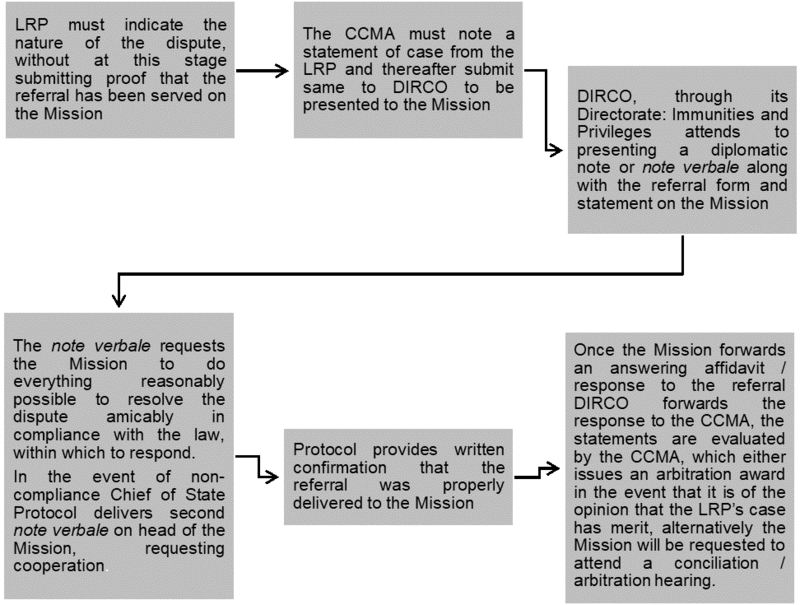 Part 4 of the Policy sets out a mechanism to enforce compliance with awards taken against Missions at the CCMA. Consequently, LRP are not without an effective remedy and their Constitutional right to fair labour practice is protected by the Policy implemented by DIRCO and it is important for Missions to ensure they are cognisant of labour laws in RSA.